The human body is about 60% water. Over the course of a day you lose water by doing things like sweating or urinating. While health authorities sometimes disagree on the amount of water necessary for proper hydration, the most common suggestion is to consume at least eight 8-ounce glasses of water a day (1). Is all water equally able to hydrate your body? Some research suggests that drinking ionized alkaline water provides your body with better hydration. If you are willing to consider making the switch from drinking regular tap water to drinking bottled, ionized, alkaline water you will find there are many options on the market including Essentia Water. Essentia Water originated in 1998 when Ken Uptain, a retired businessman, started the company because he realized how ionized alkaline water was making such a big difference in the lives of his friends and coworkers. Essentia Water is produced through a 3-step process: purification, addition of electrolytes, and ionization. In the first step of purification, water is run through micro-filters, reverse osmosis, and ultraviolet exposure. According to Essentia Water, after the water has passed through this purification process it has a purity level of 99.9%. After the purification process, pure alkaline electrolytes like magnesium, calcium, potassium, and sodium bicarbonate are infused in the water. The blend of electrolytes creates a clean smooth taste in the water. Finally, the company’s proprietary ionization process removes bitter-tasting acidic water ions which results in water with a pH level of 9.5. If you haven’t already, read our article on the health benefits of drinking alkaline water to learn why a pH level of 9.5 is such an incredible benefit to drinking Essentia Water. You may be tempted to test the water yourself to determine if the bottled water can maintain its pH level but there are a few factors you will need to keep in mind when testing purified water. On their website, Essentia warns against attempting to test the water with pH strips or Litmus paper that you might use to test other liquids. In order to accurately test the pH level of purified water, it is important to use a calibrated pH meter. Among other reasons, Litmus paper tests require that the liquid have a TDS, or total dissolved solid level of 150 ppm or higher. Essentia water has a TDS level of 70 ppm due to their purification and ionization processes. If you wish to pursue testing of their water, Essentia provides detailed instructions on how to do so on their website. Like most bottled alkaline water companies, Essentia Water claims that their water does a better job of rehydrating your body than the leading purified water brand. Unlike other companies, Essentia Water actually had a clinical study conducted by an independent laboratory in May 2014 prove that Essentia Water’s claims were founded. First, they had to find a reliable way to measure dehydration in test subjects. In 2012, they discovered that as people got dehydrated the viscosity or thickness of their blood increased. Once they had established a means of measuring dehydration they were able to move on to the next step and determine whether or not Essentia Water rehydrated better than other water. In the double-blind, placebo controlled clinical, 100 healthy adults (50 men and 50 women between the ages of 25 and 49) were mildly dehydrated by means of moderate physical activity. Over the course of 2 hours, they were rehydrated and observed. By measuring blood viscosity, they were able to determine that the adults drinking Essentia Water returned to their original hydration level 60 minutes faster than the adults drinking the leading bottled water brand. As a result of this study, Essentia Water and the results of the study were cited in the 2015 edition of the Physician’s Desk Reference (2). Interestingly, Essentia water is the only bottled water to be mentioned in the Physician’s Desk Reference. She claims that she decided to try drinking only Essentia Water for one week to determine how it impacted her body. She was so pleased by the results she began promoting the water as a part of her diet and exercise program. Some of Kaiser’s clients include Kelly Ripa, Shakira, Emmy Rossum, and Jackie Cruz. Essentia Water is bottled in BPA phthalate free plastic water bottles. Essentia bottles are made out of PET-1 plastic and can be recycled at almost any recycling plant. Essentia Water bottles can be purchased in 5 different sizes: 12 oz, 20 oz, 700 mL, 1 liter, and 1.5 liters. If you find yourself interested in trying out the water for yourself you can go on Amazon.com and purchase the water in varying sizes and quantities. If you prefer to pick up the water while doing your regular grocery shopping, you will find Essentia Water available in most grocery stores and natural health food stores. You can use the store locator on their website to find all the locations near you where their water is available. Essentia Water's proprietary ionization process transforms water from anywhere in the world into supercharged alkaline water; minimal transportation translates into less impact on the environment. Experts in creating ionized alkaline bottled drinking water, Essentia's mission is to enhance people's lives through better rehydration*, serving the doers, the believers and the achievers. Go further for longer with Essentia's bottled water; increase potential with better rehydration*; great for running, jogging, exercising, walking, hiking, rowing, biking or climbing. Rehydrate throughout the day with Essentia Water; the clean, smooth taste invites individuals or teams to replenish easily whether working, playing sports, adventuring, studying or resting. Essentia Water is bottled in BPA and phthalate-free plastic bottles that are reusable and recyclable; the convenient 12-case of 1.5 liter-bottles is easy to store at home or take on every outing. When comparing Essentia Water to other brands of bottled alkaline water, there are several things that set Essentia apart from its competitors. First, their water goes through a vigorous purification process. With reverse osmosis, ultraviolet exposure, and many micro-filters, Essentia can take any water and ensure that it exits their purification process with a purity level of 99.9%. Second, through a clinical study by an independent laboratory, Essentia can scientifically prove that their water has superior hydration powers to regular bottled water. 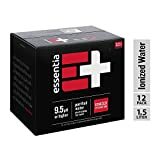 Finally, Essentia Water boasts an incredibly high pH level of 9.5 which is an incredible perk for those looking for the benefits of alkaline water. If you are anxious to feel rehydrated and ready for anything, give Essentia Water a try today!